TWD recipes + meetings that require treats = perfection. This past weekend, I had a very productive officer meeting with my Dallas EK sisters, to which I was asked to bring a dessert (and where, by the way, we decided that ’09-’10 programming will rock). So… I got to work on the brioche dough on Saturday afternoon (after a little shopping trip), while the outside temps continued to climb into the 100s (PERFECT weather for rising brioche dough, not so perfect for Hornedfroggy to be comfortable). Click on over to Chez Us and visit Denise for the recipe but don’t forget to check out the other TWD bakers here! Your tart is perfect! I had trouble visualizing what a ‘brioche tart’ would look like – and now I know, exactly! What a creative topping: strawberries, walnuts, and Nutella. I used apricots and almonds — this brioche would be great with just about anything on top! 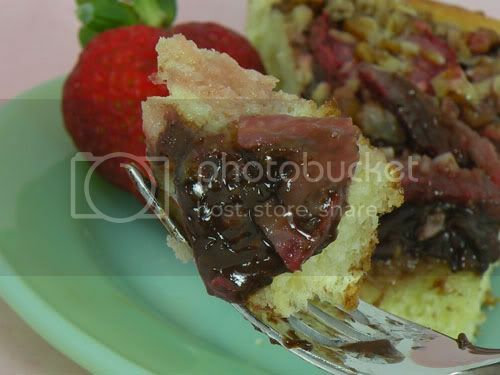 Nutella and strawberries – sounds like perfection! 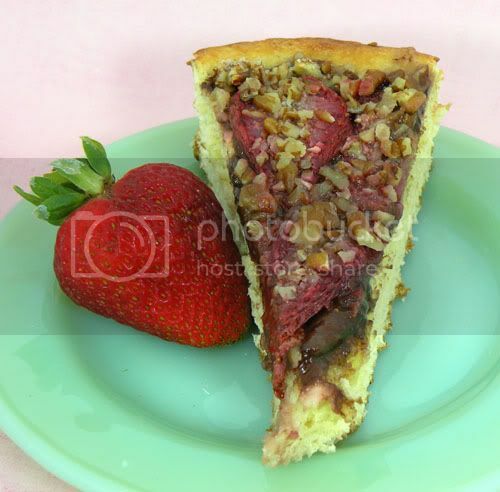 what an amazing looking tart with all of my favorite flavors. Awesome job. Wow. Great combo! I want some now. Pretty!! You’re pathetic friend Amy punked out again and remains a “brioche-virgin”….so sad. 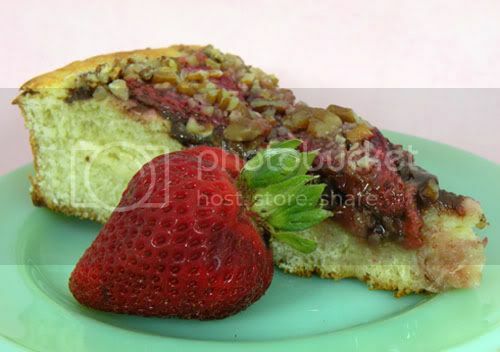 I love that you used nutella, strawberries and walnuts. I LOVE LOVE LOVE LOVE LOVE that you used Nutella! I think I would have went nuts over this if there was nutella on it! Your baking heart did a wonderful job on this brioche! I love it! Great combo. with all the flavors going on! What a delicious snack to bring to your meeting! No wonder you didn’t manage to salvage much! I like your filling a lot better than plums! Wow. I wish I was at the meeting. Everyone came up with such great fruit combinations. Strawberries and nutella…yummy. I used Nutella too, but with cherries 🙂 and I did plums with jam on the other half. I loved the Nutella side! Yours look fabulous, so glad everyone like it! I figured there was a way you were all going to try to bring chocolate into this mix!! LOL. Well, I am happy that you loved it…mine was sans chocolate, and don’t you dare tell the guys there is a chocolate version! Looks and sounds great. Brioche is so delicious and I can’t imagine how great it would be with chocolate and strawberries. Great combinations. If there isn’t much to photograph, you know it was good. The nutella and strawberry sound wonderful together. That’s my kind of brioche!! I love that you used nutella! I have a full container in my cabinet I need to use up and this recipe sound delicious!! !